You are truly One Lovely Blogger and an inspirational force that is wonderful for all of us who read your posts eagerly. Congratulations dear one – and welcome to the 50’s. The water’s warm! Well, you made me cry, but hell, we don’t care at 50, do we? Thank you. The feeling is mutual as you can see by your name in my list of nominees. You must be getting writers cramp from accepting all of the awards. Thank you for writing. Congratulations and bask for as long as you can! Congrats and much deserved by the way! Thank you for including my site among the oh so talented bloggers you mentioned. I am humbled and very appreciative. It still causes wonder and amazement for me. I have to tell you though, I have a couple others that I need to claim so if you don’t think it too cheeky of me, I’d like to put them together in one post rather than doing 3 separate. I didn’t want you to think I was cheating…but each of them require 15….and I like to pay special attention to the newer sites I’ve found (or have found me) and I don’t think I have 45 of them. lol. So, if you will indulge, I will accept, proudly link back to you, but only list the nods once. Is that ok? Again, thanks and I’m glad you are having as much fun as I am. Thank you so much my sweet. I’ve won this award before, but I really do appreciate your help in getting me more readers. I will pass the word on about your blog. You rock girlie! Congratulations! Please let us know how you go. You’ve just made my day! Thank you and please keep writing. 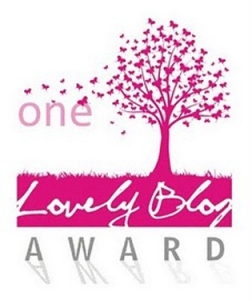 Congratulations for receiving the Lovely Blog Award! And Thank you for nominating me, I am honored. I really enjoy your posts, keep em coming!